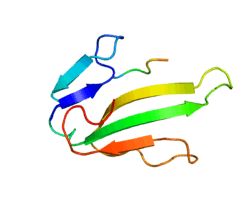 Acetylcholine receptor subunit alpha is a protein that in humans is encoded by the CHRNA1 gene. ↑ "Drugs that physically interact with Acetylcholine receptor subunit alpha view/edit references on wikidata". 1 2 "Entrez Gene: CHRNA1 cholinergic receptor, nicotinic, alpha 1 (muscle)". ↑ Kreienkamp, H J; Maeda R K; Sine S M; Taylor P (March 1995). "Intersubunit contacts governing assembly of the mammalian nicotinic acetylcholine receptor". Neuron. UNITED STATES. 14 (3): 635–44. doi:10.1016/0896-6273(95)90320-8. ISSN 0896-6273. PMID 7695910. ↑ Wang, Z Z; Hardy S F; Hall Z W (November 1996). "Assembly of the nicotinic acetylcholine receptor. The first transmembrane domains of truncated alpha and delta subunits are required for heterodimer formation in vivo". J. Biol. Chem. UNITED STATES. 271 (44): 27575–84. doi:10.1074/jbc.271.44.27575. ISSN 0021-9258. PMID 8910344. Bracci L, Lozzi L, Rustici M, Neri P (1992). "Binding of HIV-1 gp120 to the nicotinic receptor.". FEBS Lett. 311 (2): 115–8. doi:10.1016/0014-5793(92)81380-5. PMID 1397297. Beeson D, Morris A, Vincent A, Newsom-Davis J (1990). "The human muscle nicotinic acetylcholine receptor alpha-subunit exist as two isoforms: a novel exon.". EMBO J. 9 (7): 2101–6. PMC 551929 . PMID 1694127. Yu XM, Hall ZW (1991). "Extracellular domains mediating epsilon subunit interactions of muscle acetylcholine receptor.". Nature. 352 (6330): 64–7. doi:10.1038/352064a0. PMID 1712080. Beeson D, Jeremiah S, West LF, et al. (1990). "Assignment of the human nicotinic acetylcholine receptor genes: the alpha and delta subunit genes to chromosome 2 and the beta subunit gene to chromosome 17.". Ann. Hum. Genet. 54 (Pt 3): 199–208. doi:10.1111/j.1469-1809.1990.tb00378.x. PMID 2221824. Hohlfeld R, Toyka KV, Miner LL, et al. (1988). "Amphipathic segment of the nicotinic receptor alpha subunit contains epitopes recognized by T lymphocytes in myasthenia gravis.". J. Clin. Invest. 81 (3): 657–60. doi:10.1172/JCI113369. PMC 442511 . PMID 2449458. Schoepfer R, Luther M, Lindstrom J (1988). "The human medulloblastoma cell line TE671 expresses a muscle-like acetylcholine receptor. Cloning of the alpha-subunit cDNA.". FEBS Lett. 226 (2): 235–40. doi:10.1016/0014-5793(88)81430-3. PMID 3338555. Oosterhuis HJ, Newsom-Davis J, Wokke JH, et al. (1987). "The slow channel syndrome. Two new cases.". Brain. 110 (4): 1061–79. doi:10.1093/brain/110.4.1061. PMID 3651795. Noda M, Furutani Y, Takahashi H, et al. (1983). "Cloning and sequence analysis of calf cDNA and human genomic DNA encoding alpha-subunit precursor of muscle acetylcholine receptor.". Nature. 305 (5937): 818–23. doi:10.1038/305818a0. PMID 6688857. Vincent A, Cull-Candy SG, Newsom-Davis J, et al. (1981). "Congenital myasthenia: end-plate acetylcholine receptors and electrophysiology in five cases.". Muscle Nerve. 4 (4): 306–18. doi:10.1002/mus.880040407. PMID 7254233. Sine SM, Ohno K, Bouzat C, et al. (1995). "Mutation of the acetylcholine receptor alpha subunit causes a slow-channel myasthenic syndrome by enhancing agonist binding affinity.". Neuron. 15 (1): 229–39. doi:10.1016/0896-6273(95)90080-2. PMID 7619526. Kreienkamp HJ, Maeda RK, Sine SM, Taylor P (1995). "Intersubunit contacts governing assembly of the mammalian nicotinic acetylcholine receptor.". Neuron. 14 (3): 635–44. doi:10.1016/0896-6273(95)90320-8. PMID 7695910. Gattenlöhner S, Brabletz T, Schultz A, et al. (1995). "Cloning of a cDNA coding for the acetylcholine receptor alpha-subunit from a thymoma associated with myasthenia [correction of myastenia] gravis.". Thymus. 23 (2): 103–13. PMID 7725386. Lobos EA (1993). "Five subunit genes of the human muscle nicotinic acetylcholine receptor are mapped to two linkage groups on chromosomes 2 and 17.". Genomics. 17 (3): 642–50. doi:10.1006/geno.1993.1384. PMID 7902325. Green WN, Claudio T (1993). "Acetylcholine receptor assembly: subunit folding and oligomerization occur sequentially.". Cell. 74 (1): 57–69. doi:10.1016/0092-8674(93)90294-Z. PMID 8334706. Talib S, Okarma TB, Lebkowski JS (1993). "Differential expression of human nicotinic acetylcholine receptor alpha subunit variants in muscle and non-muscle tissues.". Nucleic Acids Res. 21 (2): 233–7. doi:10.1093/nar/21.2.233. PMC 309097 . PMID 8441631. Engel AG, Ohno K, Milone M, et al. (1997). "New mutations in acetylcholine receptor subunit genes reveal heterogeneity in the slow-channel congenital myasthenic syndrome.". Hum. Mol. Genet. 5 (9): 1217–27. doi:10.1093/hmg/5.9.1217. PMID 8872460. Wang ZZ, Hardy SF, Hall ZW (1996). "Assembly of the nicotinic acetylcholine receptor. The first transmembrane domains of truncated alpha and delta subunits are required for heterodimer formation in vivo.". J. Biol. Chem. 271 (44): 27575–84. doi:10.1074/jbc.271.44.27575. PMID 8910344. Croxen R, Newland C, Beeson D, et al. (1997). "Mutations in different functional domains of the human muscle acetylcholine receptor alpha subunit in patients with the slow-channel congenital myasthenic syndrome.". Hum. Mol. Genet. 6 (5): 767–74. doi:10.1093/hmg/6.5.767. PMID 9158151. Milone M, Wang HL, Ohno K, et al. (1997). "Slow-channel myasthenic syndrome caused by enhanced activation, desensitization, and agonist binding affinity attributable to mutation in the M2 domain of the acetylcholine receptor alpha subunit.". J. Neurosci. 17 (15): 5651–65. PMID 9221765.